Ten years after Sept. 11, the war on terror may still rage, but the terrorists have won an important battle. “My brother said he’d pay me not to race today,” said the guy behind me, as we stood waiting to start the 6th annual Nation’s Triathlon on Sept. 11, 2011. I had looked forward to participating in this race on this day. I knew the course made a loop by the Washington Monument, and I thought it would be a symbolic place to be on the 10th anniversary of Sept. 11. I have never been especially patriotic, and I thought having that experience might help me feel more in tune with the remembrances going on around me. But even after more than three years in a city whose color-coded threat level was always at red, it had never once occurred to me to be afraid to be running around the National Mall on 9/11/11. It doesn’t make any difference where I was on Sept. 11, 2001. I remember, of course, and likely always will. But, like the vast majority of Americans, I wasn’t doing anything of any significance. Nevertheless, the coverage of this anniversary has focused on the question “where were you?” rather than asking what the past 10 years have done to our world. Maybe it’s because that question is far more difficult and painful to answer. The time I felt most patriotic was while I lived abroad. I moved to Moscow about six weeks after the U.S. invaded Iraq, and I found myself often having to explain (if not justify) the actions of my country to curious Russian friends. I was frequently surprised at how willing they were to accept that the actions of the government did not necessarily reflect the beliefs of all the people – maybe because that’s how government often works in Russia. Living in Moscow, “American” became part of my identity in the same way that living in the U.S., I was defined as a “southerner.” And I spent a lot of time thinking about what that meant. As my daughters got older, I considered deeply how to help them embrace the positive aspects of what it means to be American while still looking at the country with a critical eye. I once asked my French neighbor how she taught her children what it means to be French. The look she gave me made it clear this was a question that had never occurred to her. To be French is to be French – it doesn’t require an explanation. Being American isn’t so easy. And the more we define ourselves by the acts of Sept. 11, the harder it becomes. Are we the fighting the good fight in the global war on terror? Are we imposing our view of what is right on other countries? Are we imperialists fighting for oil or part of a multinational coalition working for the global good? 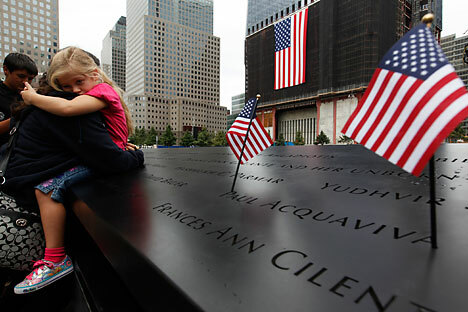 On the morning of Sept. 8, 2011, K asked me point-blank over breakfast: “What happened on Sept. 11?” I suppose it was naïve of me to be surprised by her question, although honestly I had hoped she would have learned the answer by osmosis. But as she hadn’t, I told her in as straightforward terms as I possibly could, the facts of what happened that day. For that moment, processing that information prevented her from asking why, although I know some day I will probably have to provide some answer to that question as well. We went on to discuss the ways the Sept. 11 attacks have affected her life. A child who took her first transatlantic flight at two months, the aspect of this most accessible to K was the need to remove her shoes and coat to go through airport security. She doesn’t know that wasn’t always the case. I pointed out that “terrorist” is now a common word, one she’s heard hundreds of times, but that it wasn’t when I was her age. We talked about why the attacks were so shocking, how part of their power lay in shattering the illusion that the United States was invulnerable. He’s right, of course. The only way we will truly win the war on terror is not only by deciding not to be afraid, but by not letting the boundaries of our everyday activities be defined by terrorists. The events of Sept. 11 were undeniably tragic, but we have let them take over our lives in ways that only hurt us. And so, yes, the terrorists have already won.